I have a new kitten and although he’s getting on much better with my older cat than he was initially, he still refuses to use the litter tray and does his business on the carpet and on my bed. What can I do to get him to use the tray? It is always a problem when a kitten/cat doesn’t use the litter tray. The first thing that you need to do is get another two litter trays! 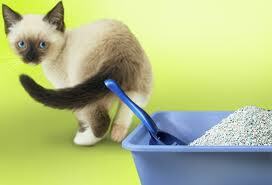 We behaviourists suggest that there should be one litter tray per cat/kitten and one extra. This way there can be no problems around using the tray. In your case the older cat might be intimidating the kitten or doing something when it is in the tray. You can also try changing the type of litter as cats can be fussy and not like the texture of the litter on their paws. You might also like to consider getting a litter tray that has a cover as cats like privacy when doing their business – you tray might be in a busy area and this could be disturbing him. 2 Responses to "Kitten won’t use Litter Tray"
Have you tried mixing the food scraps into the food or not giving him anything else – leave him in a room with just the kitten food until he eats the food. Make sure he has plenty of water and a little tray and spend time with him, but only offer him the kitten food. If he hasn’t eaten anything you can give him a few scraps once a day but otherwise be strict with the food alone. my kitten will not listen to me nor will he eat cat food he only eats food scraps.what do I do?